This exhibition is offered as a small tribute to the Ó Longáin family’s lasting legacy to Irish scholarship and is hosted by the Royal Irish Academy Library in association with Roinn na Nua-Ghaeilge, University College Cork. Spanning four generations of scribal endeavour, the Ó Longáin family were based successively in counties Limerick and Cork, with later generations spending time in Dublin and farther afield. Micheál mac Peattair (c. 1693- 1770), his son, Micheál Óg (1766-1837) and his sons, twins Pól (1801-66) and Peattair (b. 1801), and Seosamh (1817-80), and his son Micheál (fl. 1870) transcribed countless collections of stories, sagas, verse, historical and religious works, working from manuscript to manuscript, but also from printed publications. They also translated texts from Irish to English. 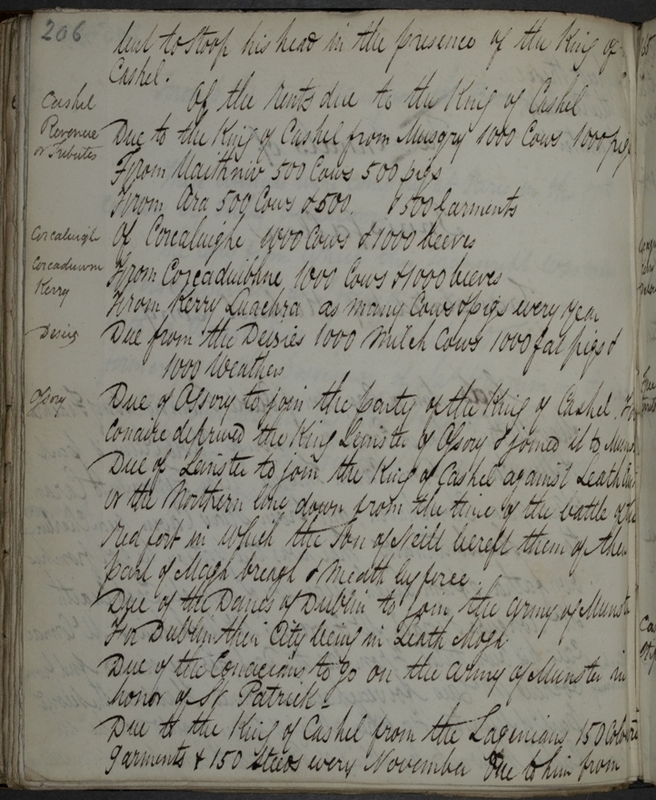 Micheál Óg and Peattair composed poetry; Pól and Seosamh compiled catalogues and indexes, and Seosamh transcribed manuscript facsimiles for publication on behalf of the Royal Irish Academy. 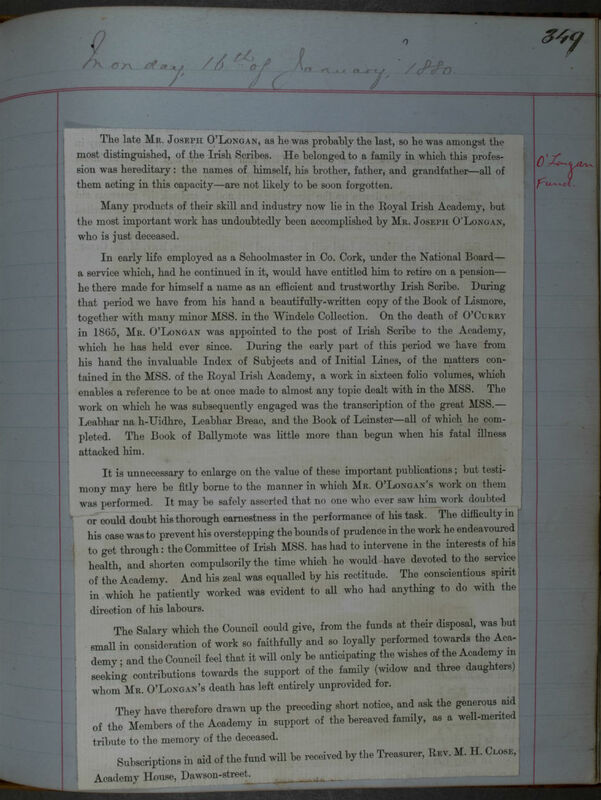 The Ó Longáins participated in a wide network of scholarly endeavour in nineteenth-century Munster, primarily engaging in the production of copies of important texts for patrons. Scribing was their métier and their vocation. They were respected for their knowledge of the Irish language, their commitment to the preservation of the ancient texts and their scribal skills. Almost without exception the Ó Longáin scribes experienced periods of severe poverty, eking out a meagre existence, living hand to mouth. They had families to support through times of rebellion and famine. Recurring references in the Academy archives attest to their impecunious state and their precarious situations. They worked as agricultural labourers, toll clerks and school masters to support themselves but a love of the manuscript tradition and a compulsion to engage in the transmission of texts were their driving forces. Those who were in positions of influence, such as Bishop of Cloyne & Ross, Rt. Rev. Seán Ó Briain (1748-69), Bishop of Cork, Dr John Murphy (1815-47) and John Windele (1801-65), the Cork antiquarian scholar, assisted with commissions and encouraged others to do so. The Royal Irish Academy provided work for Pól and later Micheál, son of Seosamh. Seosamh was engaged as Academy scribe in 1865 in place of Eugene O’Curry whose death in 1862 had left a major gap in the Academy’s manuscript project. He worked for the Academy until his own death in 1880. Proud of their language and of the history, poetry and prose it conveyed over centuries, the Ó Longáin family by their tenacious adherence to the scribal tradition, ensured the preservation of hundreds of texts for generations to come. Their work is held in the collections of Maynooth University, the National Library of Ireland, University College Dublin and the Royal Irish Academy, as well as numerous other libraries in Ireland, the UK and beyond. 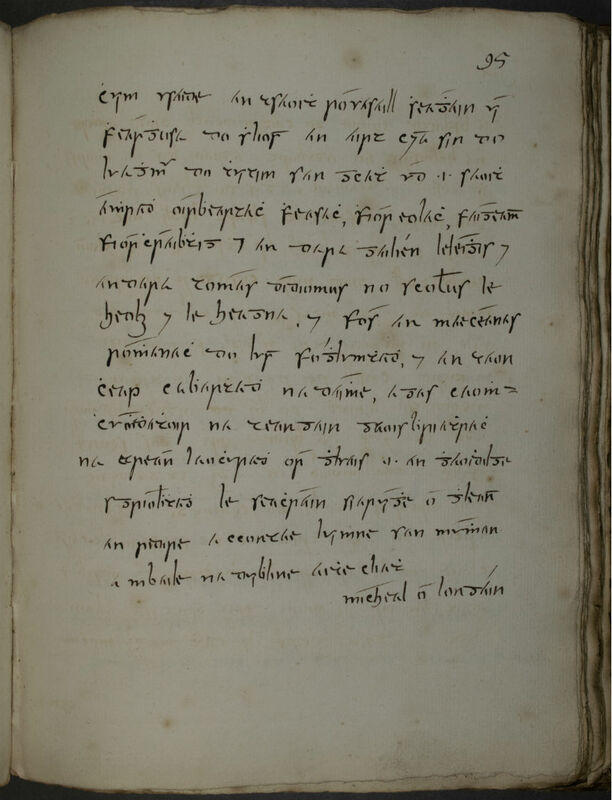 The Academy holds in excess of 230 manuscripts composed or transcribed by the Ó Longáin family. Mícheál mac Peattair (c. 1693-1770) spent his early years at Ballydonoghue, near Glin, Co. Limerick. He was employed as land agent to Edmond Fitzgerald (d. 1765), last Catholic Knight of Glin. The latter was divested of his lands in 1741 upon the conversion of his brother to Protestantism, thereby inheriting the Glin title and lands. Shortly after this time Mícheál mac Peattair had a disagreement with the new Knight and he left Glin. Thereafter he led a fairly peripatetic existence in Limerick and west Cork. His journeyings brought him into contact with poets and scholars and he participated in poetry gatherings of the Maigue poets (Aindrias Mac Craith and others). He composed poetry himself e.g. ‘Im aisling ar mo leabaidh is mé aréir im luighe’ (‘In a dream last night as I lay upon my bed’). 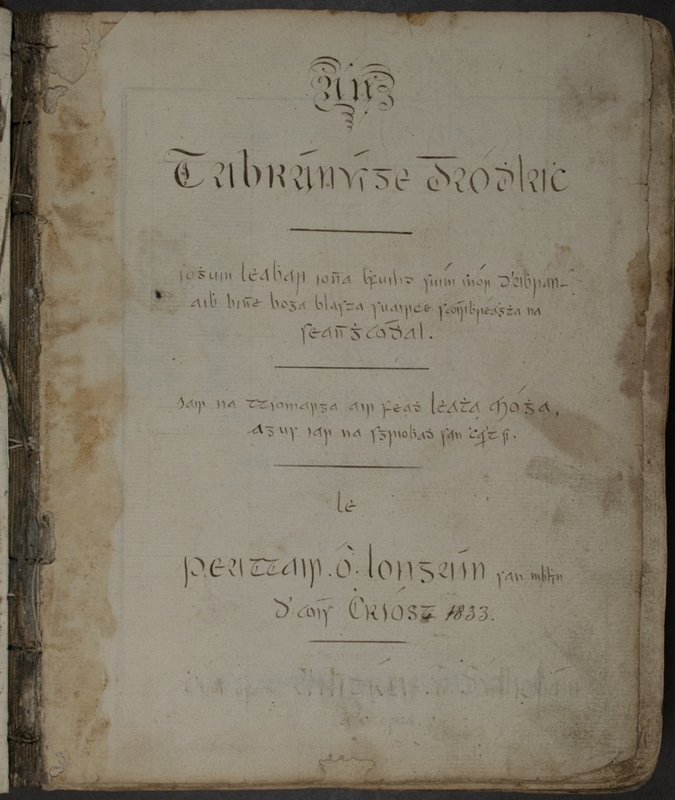 For the most part, Mícheál mac Peattair’s scribal works lack details such as places and dates of composition, however there is evidence that he completed his first transcription in 1711 at the age of 18 ― a copy of the Chronicum Scotorum. This is now in the collections of the American Irish Historical Society at New York. From 1740 onwards more of his transcripts can be dated and placed in context. 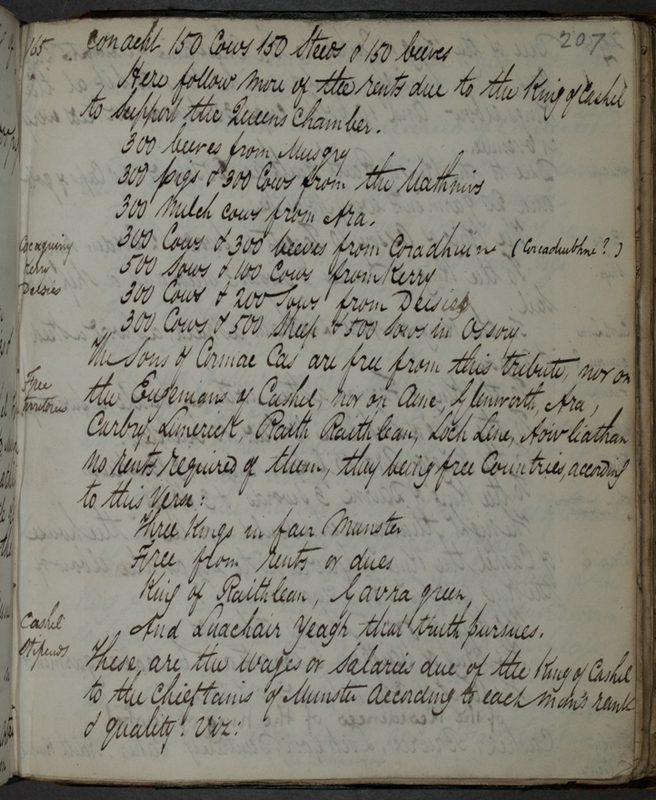 He transcribed MS 23 0 37, shown below, in Dublin c. 1752 for Dr John Fergus (d. 1761). We also find him in Bandon, east Carbery and south Kerry. He transcribed prose, poetry, Ossianic tales, medical materials, histories. He also transcribed genealogies of Munster families for the Right Rev. Seán Ó Briain, Catholic Bishop of Cloyne and Ross (1748-69). Ó Briain was a lexicographer and would have required texts from which to extrapolate vocabulary for his projected Irish-English dictionary ― Focalóir Gaoidhilge-Sax Bhéarla (Paris, 1768). Ó Briain became a patron of Mícheál mac Peattair and introduced him to others who required scribal services. Micheál mac Peattair settled in Carrignavar, Co. Cork, in the 1760s. His son, Micheál Óg was born in 1766 at Béal Átha Maghair. Nothing is known of Mícheál mac Peattair’s wife. He died around 1770 and was buried at An Teampall Geal Móin Mhór in north Co. Cork. 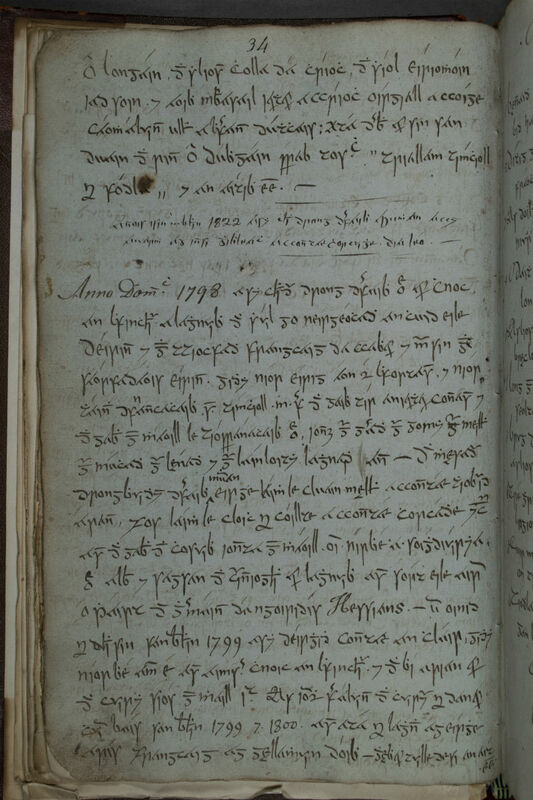 Transcribed by Mícheál mac Peattair in 1752 for Dr John Fergus, this manuscript consists of tales ─ Cath Mhuighe Muchroimhe, Cath Mhuighe Léana and Tuarusgbháil Chatha Gabheadh in the form of a dialogue between St Patrick and Oisín. Note the scribal signature here at the end of the first tale on p. 95, 'Michael Ó Longáin'. Mícheál worked around the Carrignavar area until 1793. There is evidence that he was involved in revolutionary activities in Ireland during the 1790s. He thought about emigrating to America but was urged by poet, Dáibhidh Ó Dubhluachra to stay and to desist from fighting. Mícheál Óg remained in Co. Cork where he continued to transcribe and did some teaching. He joined the United Irishmen in Cork city in 1797, became an organiser and recruiter, and was secretary of the Carrignavar branch. The peripatetic nature of his work as scribe and schoolteacher created a cover for him as letter-carrier for the organisation. Poems composed by Mícheál Óg graphically describe the defeats in Co. Wexford and are rallying calls to arms to the men of Munster. He was forced to go on the run from Carrignavar in 1799 when it became evident that the authorities were on the look-out for him. In the aftermath of the Act of Union, he kept abreast of Napoleonic conquests on the continent and hoped for a French invasion. Around 1800, Mícheál Óg married Máire Uí Chrualaoich, a widow with a daughter, also Máire, who became a favourite of her step-father. The family lived in poor circumstances; although Mícheál continued to scribe and teach, he also took on a labouring job. Twin sons, Pól and Peattair were born in 1801, followed by five other children born between 1805 and 1817. This last was Seosamh who was eventually to become Academy scribe. In 1802 the family moved to Cork city, to the home of Donnchadh Ó Floinn, an important patron who was instrumental in introducing Mícheál Óg to other patrons and scribes. Soon after the family moved to Co. Limerick, then to north Kerry, moving to and fro between the two counties for some time. All the while Mícheál completed some transcriptions, but he also worked as a farm labourer and teacher. He maintained contact with Ó Floinn and also corresponded in verse with a whole network of Cork poets. The family returned to Co. Cork in 1807. 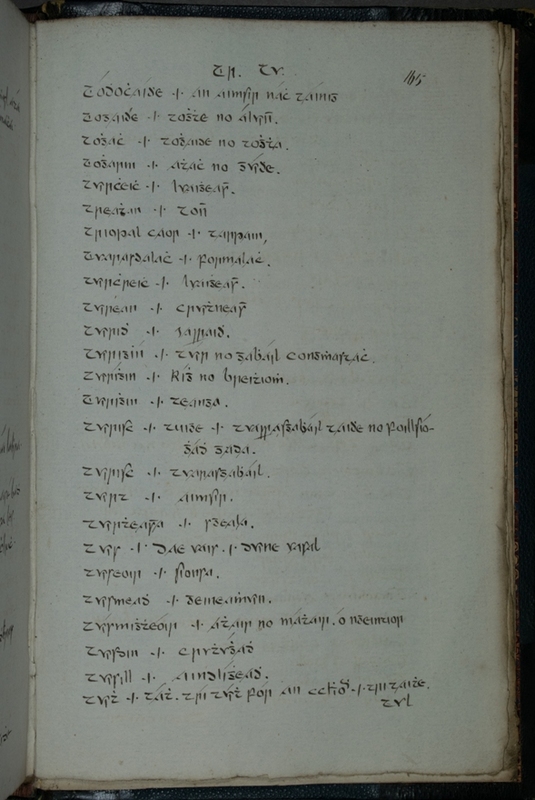 RIA MS 23 G 24 contains a list of books in Mícheál Óg’s possession at the time; he considered these to be essential for the promotion of scholarship in the Irish language. The list included Keating’s Foras feasa…, Ó Briain’s Foclóir, prose works, duanairí (poem books), catechisms etc. All of this time the scribe appears to have been writing mainly for his own use, earning his living by teaching and occasional other work. In 1814 he set up a school at Glanmire. He had begun to work for patrons whose first language was English, one of whom was Henry J. Heard, Vicar General of the Church of Ireland Diocese of Ross. Heard commissioned copies of Fenian prose tales. His other main patron was the Catholic Bishop of Cork, Rev. Dr John Murphy. He also completed work for a Mr Wily in Douglas, complete with English translation. In 1815, the family settled in Cork city. 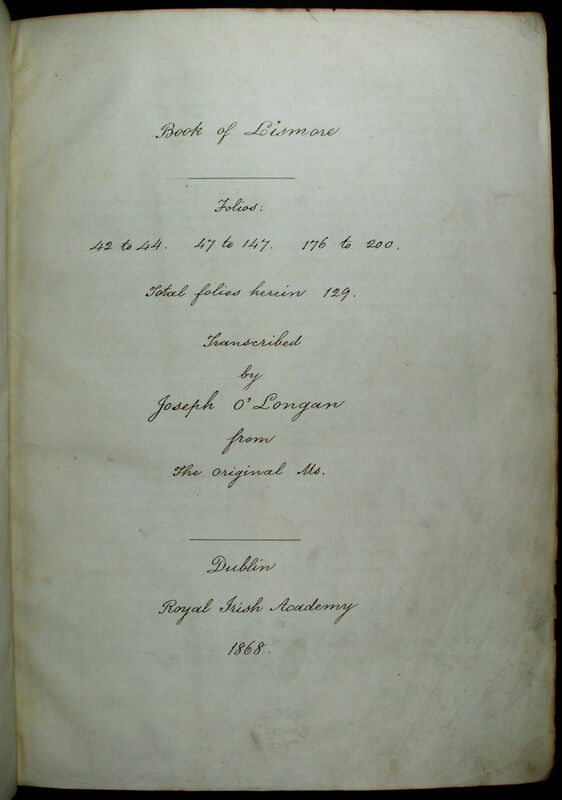 It was in December 1815 that Donnchadh Ó Floinn brought the Book of Lismore to the city, on loan from Lismore Castle. 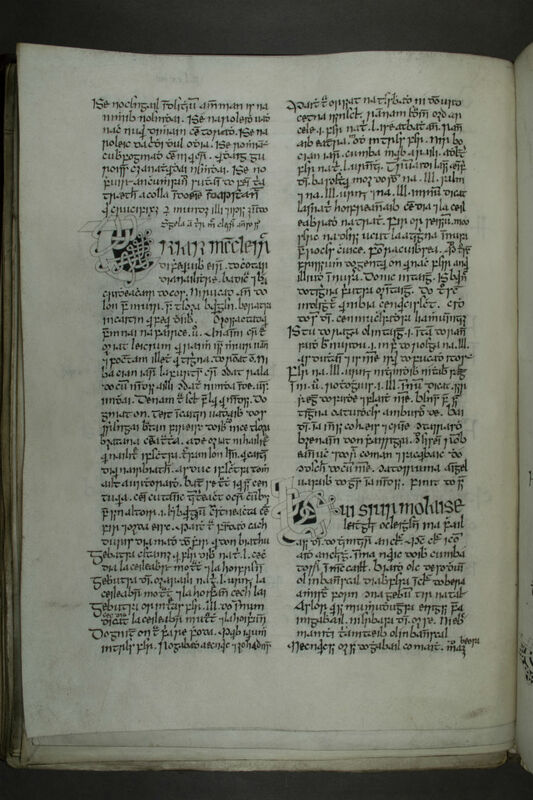 Mícheál Óg’s work on the manuscript is described in the section on the Book of Lismore. Together with his son Pól, Ó Longáin translated devotional texts from English to Irish for Bishop Murphy. He also began working for Cork banker, James Roche, as did the twins. Another important figure was Rev. Pól Ó Briain, first professor of Irish at St Patrick’s College, Maynooth whose Practical grammar of the Irish language, was admired by Ó Longáin for its application for teachers of the language. 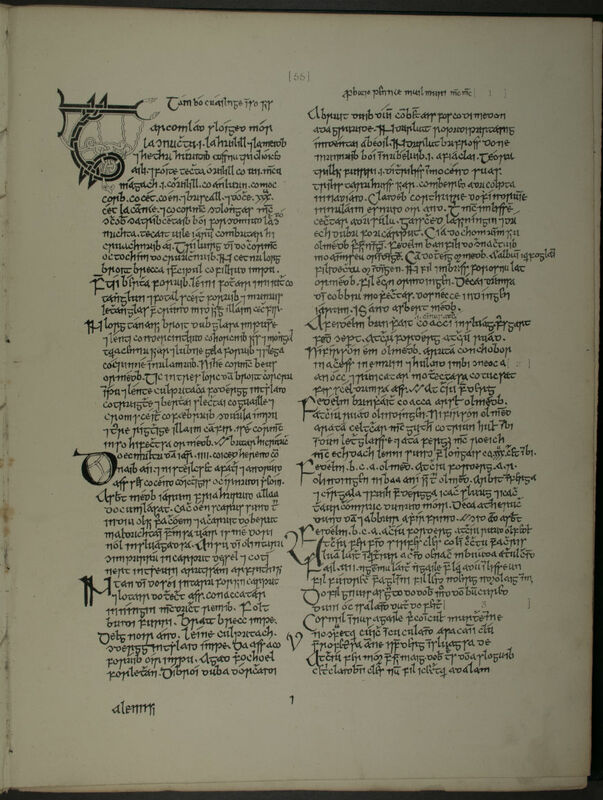 Throughout these years in Cork, which were amongst his most prolific as a scribe, Ó Longáin participated in the wider network of scribes and he joined the Cork branch of the Gaelic Society. There is a sense of lively intellectual activity at this period. However, a recessionary period in the early 1820s led to a decrease in commissions and reduced circumstances for the family who once more uprooted, moving finally to Carrignavar in 1822. There, Ó Longáin did some for the Bible Teachers Movement, a Protestant society which employed Irish speakers to promote proselytization through the medium of Irish.By 1823 the family was destitute and Ó Longáin’s sight was failing. In 1824 the family moved to Murragh, near Bandon where Mícheál Óg took charge of a school.Whilst in the Bandon area he received several commissions for transcriptions.The family moved back to Carrignavar and once more Mícheál Óg worked for Heard, Ó Floinn and others, scribing in both Irish and English.In 1829, Eugene O’Curry contacted Ó Longáin via an intermediary, expressing his admiration of his work and hoping for a meeting.There is no record that a meeting ever took place. Mícheál Óg died at Knockboy on 17 May 1837, aged 70.He scribed almost to the end. His contributions were manifold ― as a teacher, as a scribe and preserver of texts, as a poet ― over 350 of his poems survive.His love of the language and commitment to the ancient and learned texts is unquestioned.However, he was enlightened in his sense of the importance of communicating the content to non-Irish speakers and in his ability to provide fluent translations of the texts.His sons, Pól, Peattair and Seosamh carried on the scribal tradition well into the nineteenth century. 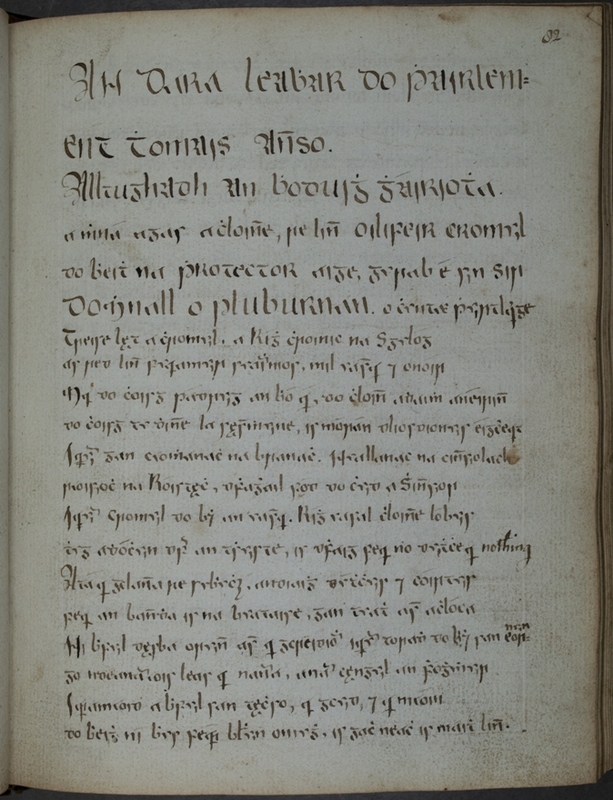 This manuscript contains Mícheál Óg’s Duanaire, or poem book. The poem shown here is ‘Gaodhal glas cionas do rádh’ by Eochaidh Ó Floinn. 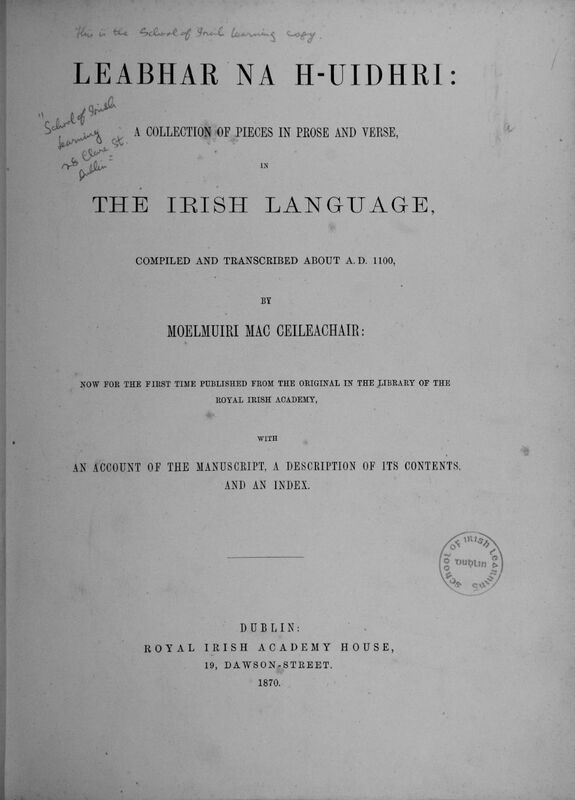 A miscellany compiled by Mícheál Óg at various locations over a long period ─ 1800-31. 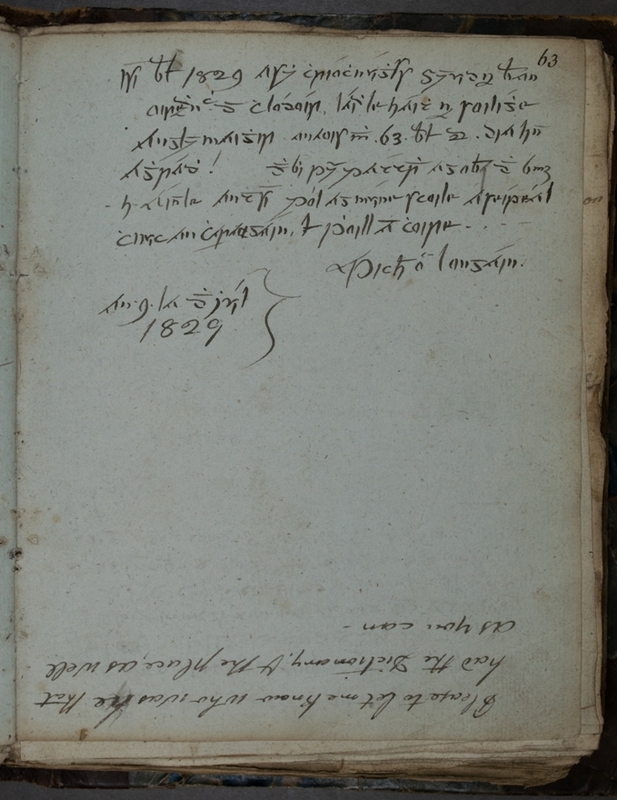 It contains a copy of Agallamh na Seanóradh, poems, an account of the 1798 rebellion, a note on the patrimony of the Ó Longáin family, a life of the saint and martyr, St Margaret inter al. 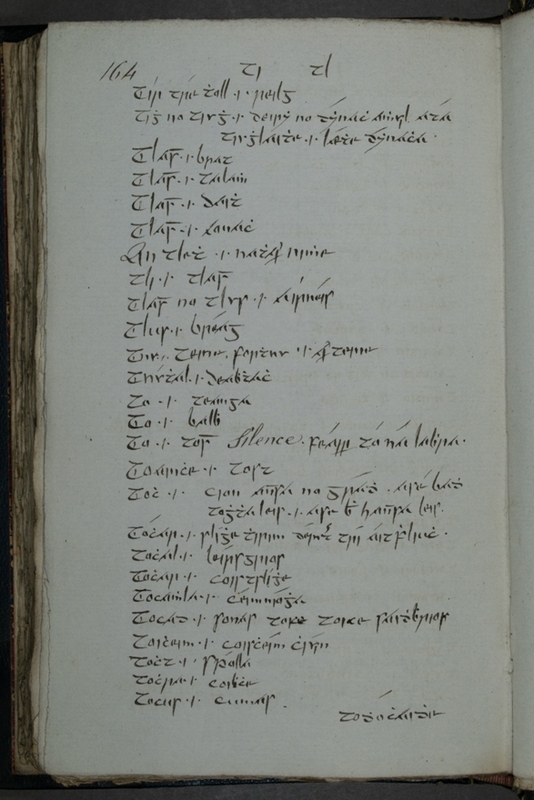 A list of the books in Mícheál Óg’s possession; he considered these to be essential for the promotion of scholarship. ‘Maidean mín riomh ghréin re sleasaimh Laoi na ccraobh’, with Peattair Ó Longáin’s signature. The manuscript lacks a scribal signature. The poem shown here ‘Maidin drúchta ar starta an Gaodhuilge luidheas’ was composed in 1795 by Mícheál Óg. The poem was indexed by his son, Seosamh, in ‘Index to Irish initial lines’, vol. 3, 1866-7. Seosamh completed the work commenced by his brother, Pól, who died in March 1866. 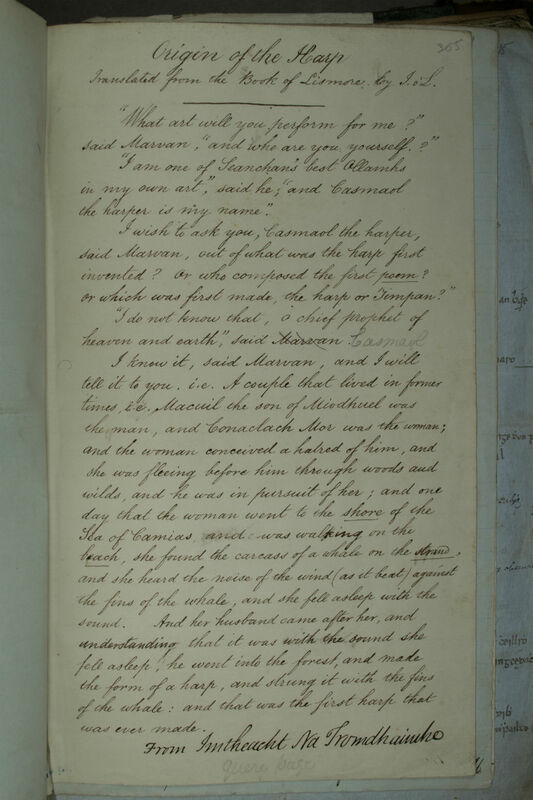 This manuscript contains a transcript of the Annals of Innisfallen made by John Windele in 1843 and from p. 205 onwards, a translation of the Annals of Innisfallen, done by Mícheál Óg Ó Longáin. Windele suspects that these are actually the Annals of Munster, another compilation. The images shown below, pp. 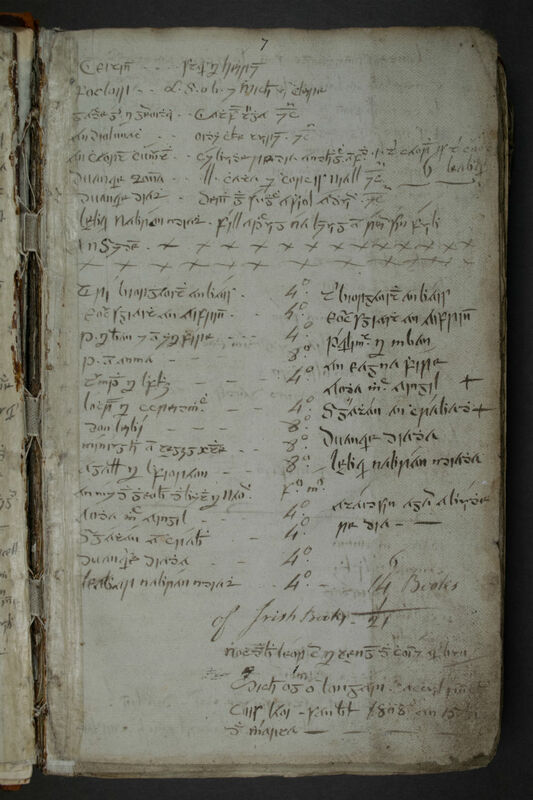 206-7, lists the rents due by the various lords of Munster to the King of Cashel. Mícheál Óg and his sons translated texts as well as transcribing them for the use of others. 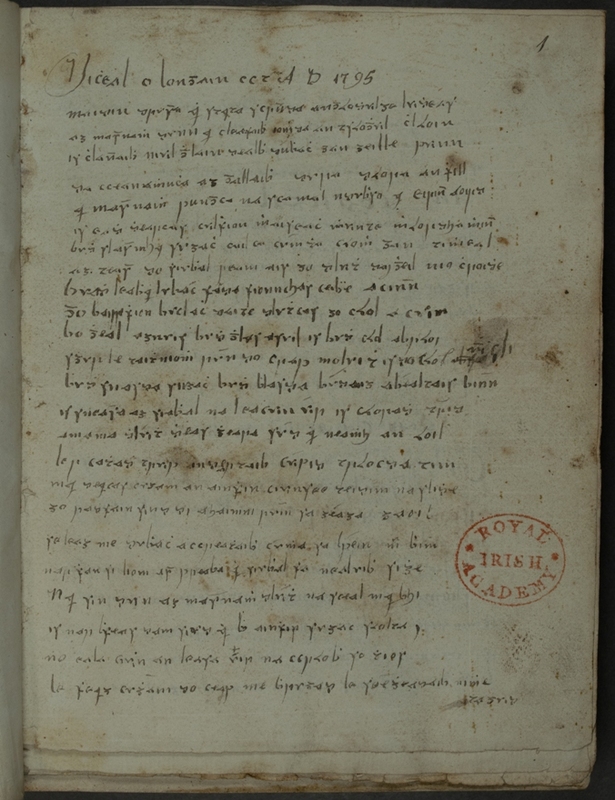 A miscellany containing texts by Mícheál Óg, a young Peattair Ó Longáin and other scribes. On p. 63 shown below is a scribal note by Mícheál Óg, dated 9 July 1829, in which he refers to having completed Seanuid na mBan for the printer; that he is now 63 years old; he refers also to his sons, Pól, Peattair and Pádraig and their whereabouts. 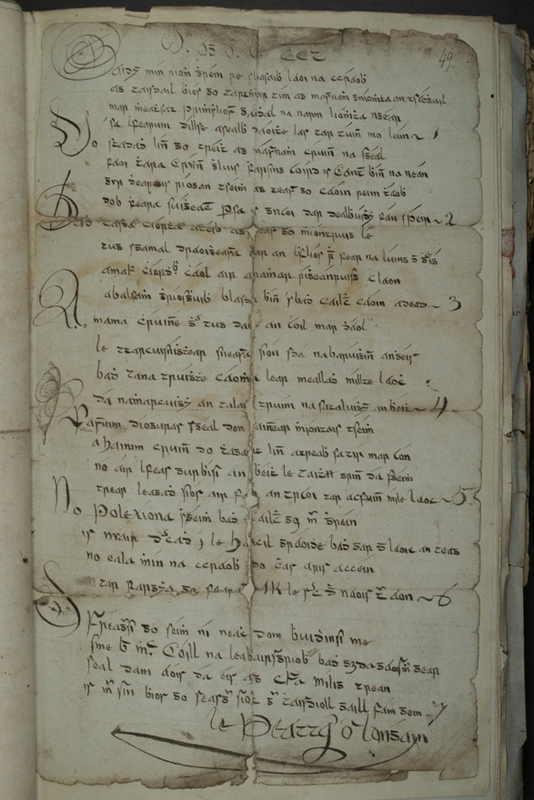 Mícheál Ó Cléirigh’s Foclóir na gaoidhelge (Louvain, c. 1643) copied by Mícheál Óg and Pól. ‘I am one of Seanchan’s best Ollamh’s in my own art’, said he, ‘and Casmaol the harper is my name’. ‘I do not know that, o chief prophet of heaven and earth’, said Casmaol. ‘I know it’, said Marvan, ‘and I will tell it to you. i.e. A couple that lived in former times, i.e. Macuil the son of Miodhuel was the man, and Conaclach Mor was the woman; and the woman conceived a hatred of him, and she was fleeing before him through woods and wilds, and he was in pursuit of her; and one day that the woman went to the shore of the Sea of Camias, and was walking on the beach, she found the carcass of a whale on the strand and she heard the noise of the wind (as it beat) against the fins of the whale, and she fell asleep with the sound. And her husband came after her, and understanding that it was with the sound she fell asleep, he went into the forest, and made the form of a harp, and strung it with the fins of the whale: and that was the first harp that was ever made’. RIA MS 23 E 25 Lebor na hUidre / Book of the Dun Cow. Compiled before 1106. 67 folios. (MS incomplete). Written in Irish at Clonmacnois. The two principal scribes were Mael Muire Mac Célechair and an unnamed scribe (A). It was revised at a later date by an interpolator (H) using different sources. It is named after a 6th-century sacred relic of Clonmacnois, the hide of the dun cow that belonged to St Ciarán. 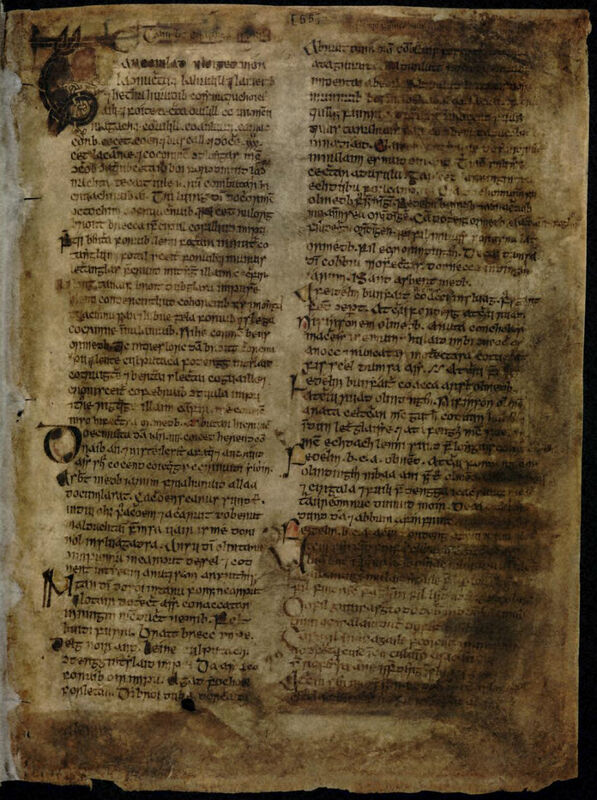 The earliest surviving manuscript with literature written in Irish, it contains the oldest version of the Táin Bó Cuailgne, the Voyage of Bran, the Feast of Bricriú, and other religious, mythical and historical material. 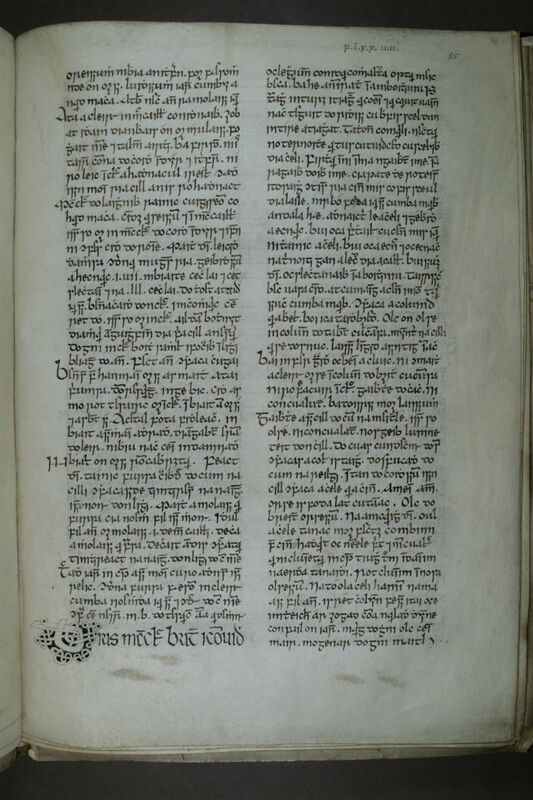 The opening shown here, f. 55v, (facsimile) is an early section of the Táin story. 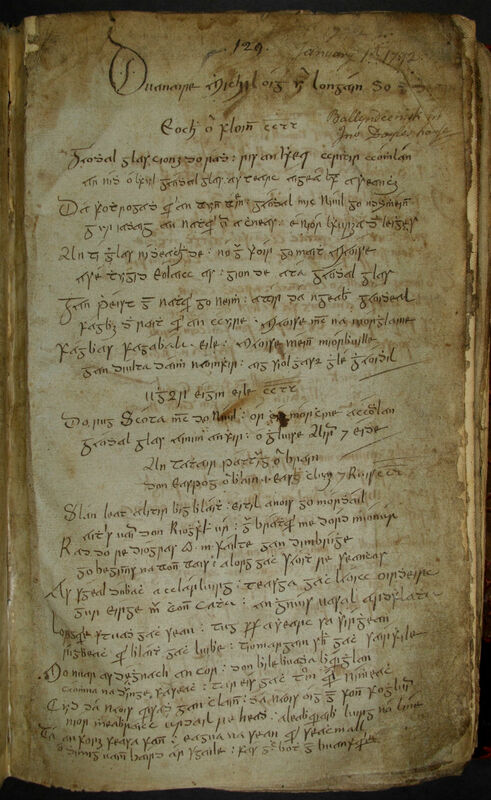 RIA MS 23 E 25 Lebor na hUidre / Book of the Dun Cow f.55v Compiled before 1106. 67 folios. (MS incomplete).